We know that a healthy, beautiful smile is one of our greatest assets. That’s why we want to help our patients maintain their pearly whites and have a gleaming smile that sparkles. Since we commenced ownership of Dentists@Burswood in 2010, we have provided excellent dental care that’s affordable and accessible. Our accreditation, which entailed a lengthy, in-depth process, shows that we place a premium on providing quality service and listening to our patients’ needs. In fact, being located close to the airport is so convenient for patients flying in and out to receive quality yet affordable dental care. Our location is also centrally located for our patients in nearby communities who wish to access excellent dental care. 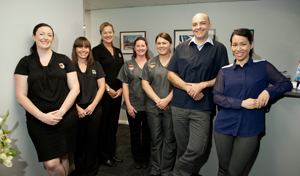 Dentists@Burswood is focused on delivering a gentle, pain-free dental care experience. We listen to our patients’ needs, diagnose the issue and help them as best we can. We also provide dental education in the form of short 30-60 second videos so you can watch them while you are comfortable in the dental chair. We want to make your dental experience with us as convenient as possible. One of the ways we do that is through our live online booking system. Patients can book an appointment at any time. If you’re not ready to book your next appointment, we can send you an online booking link. The link will take them to a personalised appointment book to whomever their usual dentist is. The system also works with pre-booked future appointments. If you have a 6-month preventative care appointment scheduled, you’ll receive an email. In that email will be a personalised online booking link that you can use to book in your appointments and your families’ appointments as well. You can even book up to 90 days in advance. Anyone who books online is always contacted to confirm that they are booking for the right treatment, or what we call a pre-clinical assessment. For affordable, accessible quality dental care that is also convenient, schedule an appointment by contacting us or using our online booking system.